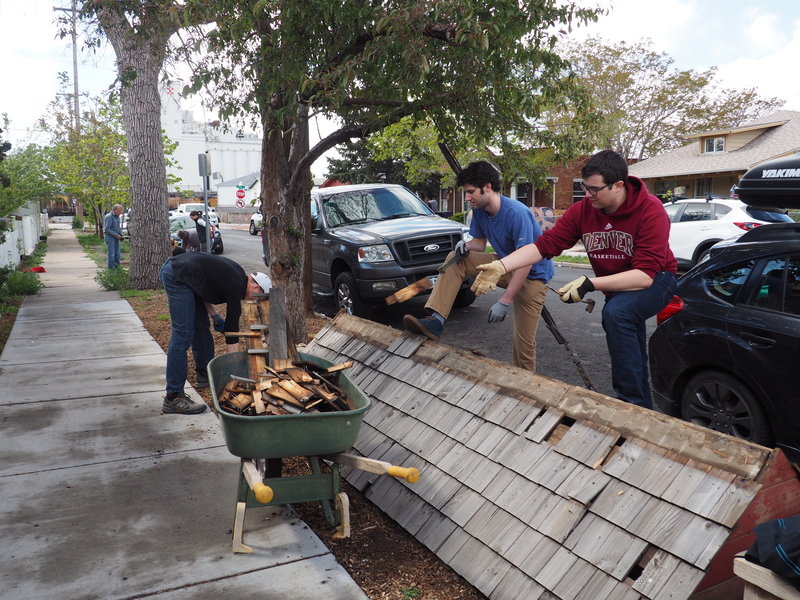 As part of our annual spring service project, 17 Boettcher Scholars and friends gathered at the The GrowHaus in north Denver’s Elyria-Swansea neighborhood on a sunny, cool Saturday in April to lend a hand and learn what’s happening there. 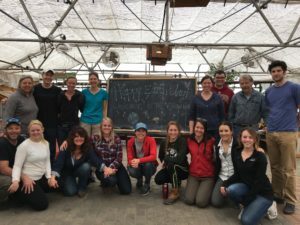 The GrowHaus is a nonprofit community center that combines hydroponics, aquaponics and permaculture farming with a daily market, food pantry and education. 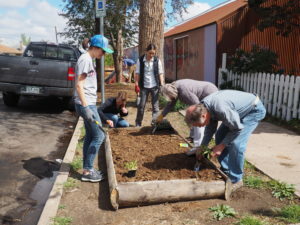 The nonprofit is pioneering food access in a neighborhood that is known as a “food desert,” meaning there are no food stores for miles. Also, the soil in many places is contaminated from earlier industrial wastes, making traditional gardens problematic in the neighborhood. 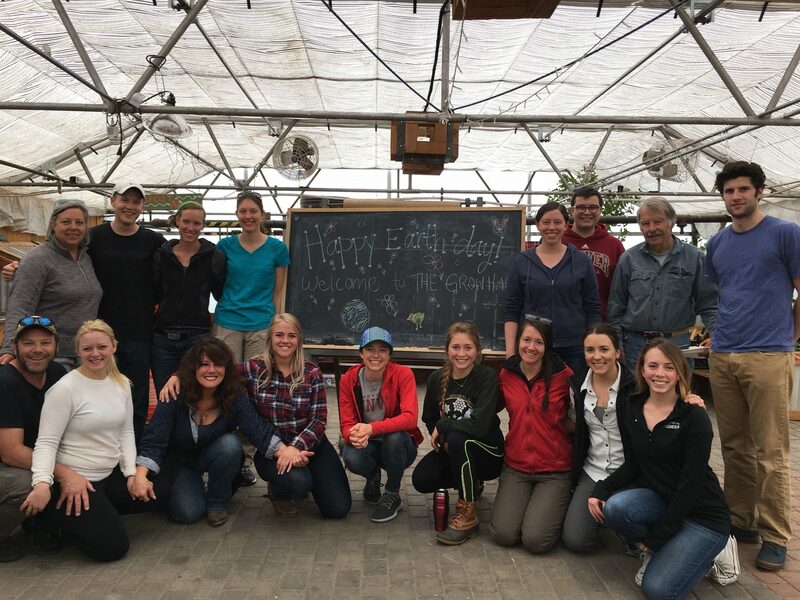 Inside the warm greenhouses is a paradise of edible plants. Some plants grow in water, others in ecosystems with fish in ponds that feed and water the plants. Others are in raised beds and hanging baskets. The Boettcher Scholar volunteer group planted, tended and watered plants. The worm beds needed new materials, so we shredded paper and mixed it into the worm bed for a tactile adventure. We also tore apart an old shed cover. While we worked, a group of about 15 kids and parents had an experiential class on growing food. The areas inside and outside were full of conversation and laughter. As the kids’ class ended, the market opened in the front of the building. A steady stream of neighbors came in to purchase fresh vegetables and herbs. The GrowHaus then became a quiet oasis where we finished with a potluck and sandwiches provided by the Boettcher Foundation. Many thanks to alumni board member Kelley Ritz and Boettcher staffer Marisa Pooley for their capable planning and implementation of this fun and educational event.